Chinese traditional medicine uses a variety of natural products to treat illness, many of which have no sound medical reasoning. In this study I am to assess the evidence for and against the use of a particular fungus called Cordyceps chinensis, to determine whether or not there is any hard science to its curative effect or whether it is just blind faith. I found some promising material on the effects of the fungus especially in the use of athletics where field tests have been performed. The problems encountered were the reliability of the claims. This was because of where the information was gathered e.g. internet and Chinese journals, where we have to be a little sceptical whether the tests and reports have been properly monitored and checked. In conclusion I found that the use of this fungus medically seems bright but more controlled investigations need to be performed, especially in the West to dispel the myths about traditional chinese medicine. Traditional chinese medicine (TCM) adopts a more holistic philosophy than in Western medicine. It emphasises the importance of balance in the mind and body and the smooth flow of an optimal amount of energy, known as chi or qi, in maintaining health. This balance is known as yin and yang . There is a lot of evidence to show that some of these ideas are sound in the treatment and diagnosis of a patient. Perhaps the best example is to look at the hormone system. Western scientists have discovered two chemical messengers that allow cells to communicate, called cAMP and cGMP. These also seem to be opposites very much like yin and yang . When Chinese doctors believe yin and yang is out of balance, western doctors see a change in the two chemical messenger levels, e.g. in the yin condition we find cAMP is low and cGMP is high and in the yang condition it, is the reverse. TCM says that every organ of the body has Qi, and it has been found when TCM says a patients heart and circulation system has lack of Qi, they are often anaemic . In Western medicine, the treatment is targeted specifically at the disease and the diseased organ. Whereas in TCM the target is the whole patient since the treatment is based on the whole system being out of balance. A good example of this in practice is to take the treatment of asthma. The Western response is to administer drugs to relive the spasms of the bronchus, but TCM looks first at the patient, asks what imbalances they show, and since each patient will manifest slightly different symptoms they are treated individually. But the two groups of patients might end up with the same chemical treatment. Ephedrine, which is prescribed by Western doctors for asthma, comes from a plant that Chinese doctors have used for hundreds of years . There are many claims of what Cordyceps mushroom can do. In China the fungus is used to regulate and support the gonads, and as a lung and kidney tonic [see claims on websites at URLs http://www.naturalways.com/liver-Enhancer.htm and http://tcm.health-info.org/Herbology.Materia.Medica/dongchongxiacao-properties.htm]. It was also recommended as a ‘for all illness’ tonic because of its claimed effects to improve; energy, appetite, stamina, endurance and sleeping patterns. According to some stockists the fungus can pretty much do everything ‘This is one of the most popular and precious longevity-promoting herbs because it strengthens the adrenal glands, increases sexual vitality, relieves bronchitis and emphysema, reduces blood fats and sugars, lowers blood pressure and improves blood circulation’. It is also supposedly able to increase a person’s immune system. These effects are cause because of its high affinity to the Yin organs; the heart, kidneys and liver. 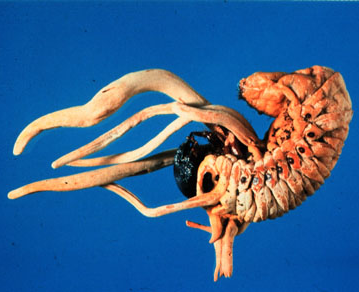 According to the Zang Fu relationship with the vital substances of the body in TCM (Table 1) the apparent effects of the Cordyceps fungus can be understood, apart from maybe the effects of relieving bronchitis and emphysema because it does not have an affinity for the lungs according to the literature I found. Table 1. Summary of the Zang Fu relationship with the vital substances of the body in TCM. Fungi are a division of eukaryotic organisms that grow in irregular masses, without roots, stems, or leaves, and are devoid of chlorophyll or other pigments capable of photosynthesis.They contain ergosterol instead of cholesterol in their plasma membranes. They reproduce sexually or asexually (spore formation), and may obtain nutrition from other living organisms as parasites or from dead organic matter as saprobes. Fungi have a well-defined cell wall composed of polysaccharides and chitin; they can be moulds, yeasts, or dimorphic  (Table 2). The Caterpillar fungus, or Cordyceps chinensis, consists of a complex of the stroma of the fungus Cordyceps sinensis and the larval corpse of a caterpillar from the family Hepialidae, on which the fungus is parasitic. In ancient China, because if its scarcity, the fungus was used in the Emperor’s Palace. The story goes that approximately 5 grams were stuffed into the stomach of a duck and roasted until well cooked, then the Cordyceps was removed and the duck was slowly eaten, twice daily over a period of 8-10 days. 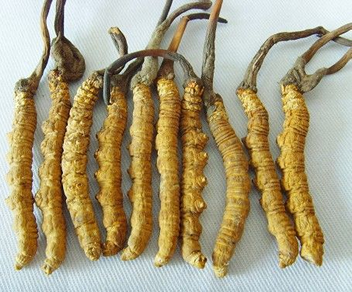 This way of preparing Cordyceps is believed to be as potent as 50 grams of Panax Ginseng [5-8]. The diseased caterpillars (Fig. 1) are naturally found in mountainous areas of China, Tibet and Nepal of mountains over 4000 m high where there is good drainage. The fungus is worth more than its weigh in gold and can sell for $350 per kg. Because of this the fungus is the main income for the villages where it is found in the spring, after the caterpillars have died and the snow is just melting, the farmers crawl the ground collecting the dead insects. They are collected at dawn because the dew drops formed on the heads of the larvae radiate off the sunlight causing them to become iridescent and thus easier to see. The fungus is also very easy to culture and grow, this is because the raw materials are easy to get hold of, for example caterpillars are produced in mass quantities for use in sterilisation techniques in the wild and also for other uses such as a food for exotic pets. The chemical constituents of Cordyceps were first determined in 1957. A crystalline substance was isolated and named ‘cordyceps acid’ but was later identified as D-mannitol. Further studies were performed to determine the constituents of the fungus but no new structures with significant pharmacological effects were found, only a series on known substances, including amino acids, steric acid, D-mannitol, mycose, ergosterol, uracil, adenine, adenosine, palmitic acid, cholesterol palmitate and many other common compounds. Various reports have been conducted in order to find what the curative effects of Cordyceps are. It has been found to have effects on hepatic function, renal function, endocrine and steroid system, cardiovascular system, anticancer activities, immunomodulation, hypoglycaemic activity in STZ-induced diabetes and in erythropoiesis and hemopoiesis . First I will deal with its effects on the cardiovascular system, stamina and endurance. The fungus made sports headlines in 1993 at the Chinese National Games, when the women’s team broke 9 world records including the 10,000 metre run by an unprecedented 42 seconds. The team had all been reported to have been given a cocktail of TCM drugs and tonics including the Cordyceps fungus. Several reports and studies have been done to provide evidence for the effects of the fungi on human performance since then. A study which was published as conference abstracts in the Medicine & Science in Sports & Exercise in 1999 [9, 10] concluded that fermentation products of a mycelial strain of Cordyceps supports normal fat mobilization and β-oxidation, thereby preserving glycogen usage during prolonged exercise. A double blind, placebo-controlled Chinese study performed on mice was conducted to find if oral administration of Cordyceps fermentation products resulted in enhanced endurance and resistance to fatigue. After three weeks of administration, the groups given CS-4 were able to swim significantly longer than the control groups. The results of the study (again published as a conference abstract) were dose dependent with results of one group showing a 30% increase in endurance and the second group showing a 73% increase in endurance. The study concluded that the cardiotonic action, inhibition of tracheal constrictions and relaxation of vascular contractions (which CS-4 evokes) elevates the ability and endurance of exercise . Another double blind, placebo-controlled study to test the effects on physical performance was performed in 1998 led by S. Morrissey of Beijing Medical University Sports Research Institute. They took 30 males and place them in three groups. Each group was given a different concoction, one a placebo, the second 500mg of the formula and the third group received 1000 mg of the formula. Blood samples measuring lactate levels were taken before, during max and after exercise. They found that the group given the most of the formula containing cordyceps experienced improved lactate clearance. Researchers concluded that lactate clearance improved due to improved lactate energy metabolism within the cell. The author concluded that using this herbal formulation would enhance lactate clearance and allow athletes greater anaerobic performance [reported in reference 12]. inhibition of chemotaxis and specific proteins synthesis of the macrophage cell line. It has also been found that a ‘polysaccharide (CS-F30)’  found in a culture of Cordyceps sinensis has a potent effect on glucose metabolism in the liver of a mouse. The polysaccharide was intraperitonealy administrated into genetic diabetic mice. The mice showed hypoglycaemic activity, ‘and the plasma glucose level was quickly reduced in normal and streptozotocin-induced diabetic mice after intravenous administration’ . Administration to normal mice of the polysaccharide significantly increased the activities of ‘hepatic glucokinase, hexokinase and glucose-6-phosphate dehydrogenase, although the glycogen content in the liver was reduced’ . In addition CS-F30 was shown to lower the cholesterol level and the plasma triglyceride level in mice. Data taken from Wang, S.-Y. & Shiao, M.-S. (2000). Pharmacological functions of Chinese medicinal fungus Cordyceps sinensis and related species. Journal of Food and Drug Analysis, 8: 248-257. PDF URL: http://www.fda.gov.tw/files/publish_periodical/8-4-4.PDF. The main problem I found with gathering evidence for this report is the obscurity of the references. A lot of the information came from the internet and so we have to question the reliability of the claims since there is nothing to tell us that what is said is true, and most of the sites were trying to sell a product to the visitor which brings up even more questions. The vast majority of journals used were obscure, many published in China and so the reliability and scrutiny of how the research was conducted also have to be taken into account. I think that from the evidence I found Cordyceps chinensis looks very promising but the lack of studies performed specifically on humans leads me not to make a conclusion on its potency . I do find its endurance effects very promising though, especially in light of the unprecedented performance of the Chinese athletes in the early 1990s. Although these have not been researched sufficiently to give unquestionable proof ‘...Some substances have been shown in Chinese studies to help animals adapt to stress. If you feed Cordyceps sinensis, a caterpillar fungus, to rats and then throw them in a pool of water, they will survive longer than rats that don’t get the fungus. This endurance effect has obvious implications for athletic performance, though no human studies have been performed, and the Ethics Committee Meeting for a human trial along such lines would be an interesting one to attend. I think that the prospects of this fungus seem bright but I feel that a lot of questions are still not fully answered. If as the Chinese journals tell us, Cordyceps does have the wide medical uses claimed, why is it not widely used or respected in Western medicine when other TCMs such as acupuncture and substances such as ginseng are? Users who put aside scientific doubts and have faith in the usefulness of the product should still be wary about the purity of the fungus obtained from their supplier. In some tests different forms of the fungus were used but were not compared with others, so it is impossible to conclude whether the various forms give the same effects. Some website shops make different claims about the product, such as: this product is wild and it cannot be cultured, where others claimed it could be cultured. This leads us to wonder whether what we are buying from the shops is actually Cordyceps, or just the sweepings of some factory floor in Asia. 1. Lewith, G. T. (1982). The conceptual basis of traditional Chinese medicine [excerpted from Acupuncture - Its Place in Western Medical Science, HarperCollins Canada/Thorsons Publishing Group] on the healthy.net website at these URLs: http://www.healthy.net/asp/templates/article.asp?id=1278 and http://www.healthy.net/scr/article.aspx?Id=1278&xcntr=2. 2. Lewith, G. T. (1984). The basic principles of Chinese traditional medicine [excerpted from Modern Chinese Acupuncture, HarperCollins Canada/Thorsons Publishing Group] on the healthy.net website at this URL: http://www.healthy.net/asp/templates/article.asp?id=1707. 3. Beinfield, H. & Korngold, E. (1991). Chinese medicine: how it works. On the healthy.net website at this URL: http://www.healthy.net/asp/templates/article.asp?PageType=Article&ID=428. 4. Moore, D., Robson, G.D. & Trinci, A.P.J. (2011). 21st Century Guidebook to Fungi. Cambridge, UK: Cambridge University Press. ISBN: 9780521186957. URL: http://www.cambridge.org/gb/knowledge/isbn/item6026594/?site_locale=en_GB. 5. Lin, B-Q. & Li, S.P. (2011). Cordyceps as an herbal drug. Chapter 5 in: Herbal Medicine: Biomolecular and Clinical Aspects, 2nd edn (Wachtel-Galor, S.ed) CRC Press. Pp. 73–105. ISBN: 978-1-4398-0713-2. Chapter DOI: http://dx.doi.org/10.1201/b10787-6; book DOI: http://dx.doi.org/10.1201/b10787. 6. Zhu, J.S., Halpern, G.M. & Jones, K. (1998). The scientific rediscovery of an ancient Chinese herbal medicine: Cordyceps sinensis: part I. The Journal of Alternative and Complementary Medicine, 4: 289–303. DOI: http://dx.doi.org/10.1089/acm.1998.4.3-289. PDF. 7. Zhu, J.S., Halpern, G.M. & Jones, K. (1998). The scientific rediscovery of an ancient Chinese herbal medicine: Cordyceps sinensis: part II. The Journal of Alternative and Complementary Medicine, 4: 429–457. DOI: http://dx.doi.org/10.1089/acm.1998.4.429. PDF. 8. Ng, T.B. & Wang, H.X. (2005). Pharmacological actions of Cordyceps, a prized folk medicine. Journal of Pharmacy and Pharmacology, 57: 1509–1519.URL: http://www.aaps.org/search/view.asp?ID=75458. 9. Dai, G.W., Bao, T.T., Xu, C.F., Cooper, R., Zhu, J.S. & Cooper, C.B. (1999). Enhanced hepatic energy state in mice after administration of a fermentation product of Cordyceps Cs-4. Medicine & Science in Sports & Exercise, 31: S120. 10. Xiao, Y., Huang, X.Z., Chen, G., Wang, M.B., Zhu, J.S. & Cooper, C.B. (1999). Increased aerobic capacity in healthy elderly humans given a fermentation product of Cordyceps Cs-4. Medicine & Science in Sports & Exercise, 31: S174. 11. Tsunoo, A., Taketomo, N., Tsuboi, H., Kamijo, M., Nemoto, A., Sasaki, H. & Uchida, M. (1995). Cordyceps sinensis: Its diverse effects on mammals in vitro and in vivo. Third International Symposium of the Mycological Society of Japan, abstracts. 12. Burke, E.R. & Gastelu, D. (1999). Avery's Sports Nutrition Almanac: Your Complete and Up-to-date Guide to Sports Nutrition and Fitness. Avery Publishing Group Inc. ISBN-10: 0895298856, ISBN-13: 978-0895298850. 13. Kuo, Y.-C., Tsai, W.-J., Shiao, M.-S., Chen, C.-F. & Lin, C.-Y. (1996). Cordyceps sinensis as an immunomodulatory agent. American Journal of Chinese Medicine, 24: 111-125. DOI: http://dx.doi.org/10.1142/S0192415X96000165. 14. Wang, S.-Y. & Shiao, M.-S. (2000). Pharmacological functions of Chinese medicinal fungus Cordyceps sinensis and related species. Journal of Food and Drug Analysis, 8: 248-257. PDF URL: http://www.fda.gov.tw/files/publish_periodical/8-4-4.PDF. 15. Smith, J.E., Rowan, N.J. & Sullivan, R. (2002). Medicinal Mushrooms: their therapeutic properties and current medical usage with special emphasis on cancer treatments. A report produced for Cancer Research UK. URL: http://sci.cancerresearchuk.org/labs/med_mush/med_mush.html. Chapter PDF. Complete PDF.